Register to receive our newsletter. Stamp your stuff and make your claim! 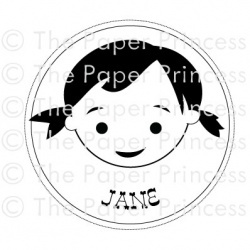 Little ones and grown ones will enjoy these personalized face stamps. Fun for stamping gift tags, books, labels, lunch bags, stationery! Simply stamp on a gift tag or card, and voila! You'll make a lasting impression! Other info: Stamp image measures 2" in diameter. Image/text is deeply etched into our clear polymer to give you sharp, crisp images every time. Please remember: Please enter your text information carefully as we cannot be responsible for any typos or misspellings. Also, please keep in mind that your stamp may vary slightly from the sample shown as type size and spacing may vary due to differences in text length(s). Please allow TWO WEEKS for the production of your stamp (PLEASE NOTE that this does not including shipping time). © The Paper Princess, LLC. All Rights Reserved. This product was added to our catalog on Sunday 14 September, 2008.